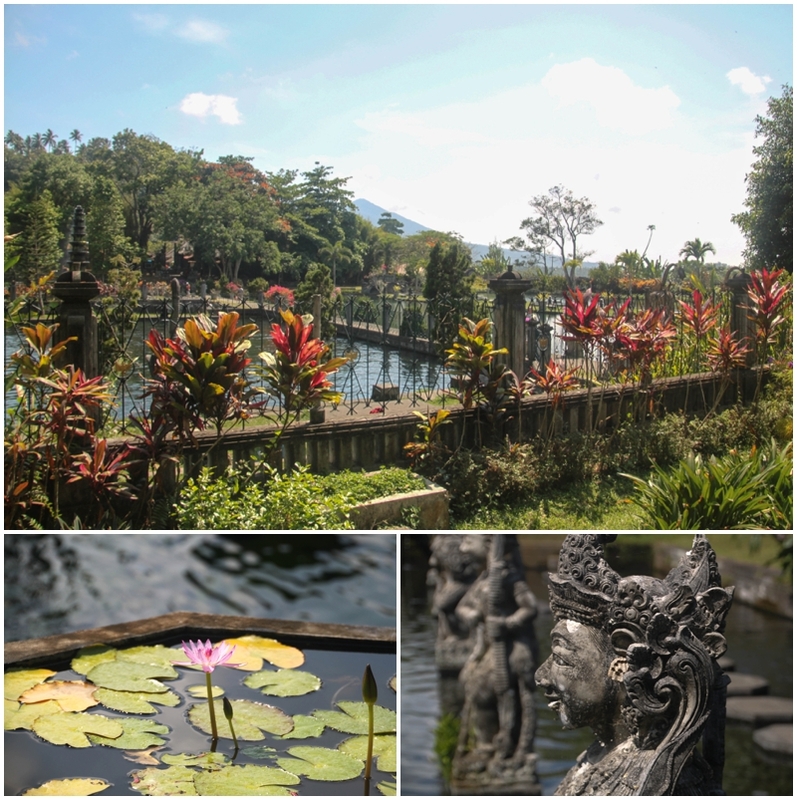 Bali has a number of beautiful waterfalls and water palaces and we were lucky enough to see a few during our time on the island. The ones we saw were easily worth the price of admission, which was generally only a couple dollars. We really enjoyed our time at each place we stopped and we would have spent even more time searching out others if we stayed longer. 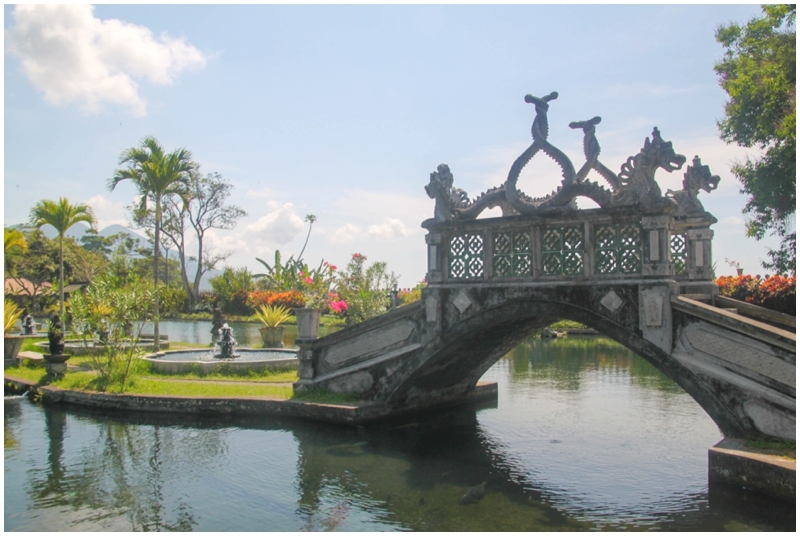 Tirta Gangga was built in 1948 and is a former royal palace near Abang, Bali. 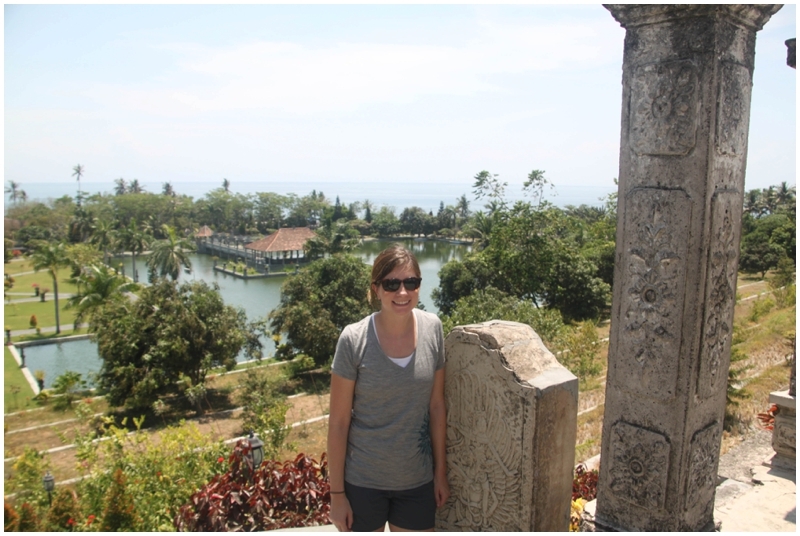 Admission is 20,000 rupiah per person or $1.64 USD and we spent about 30-45 minutes taking in the scenery. We walked around enjoying the beautiful day and checking out the gigantic goldfish in the various ponds. 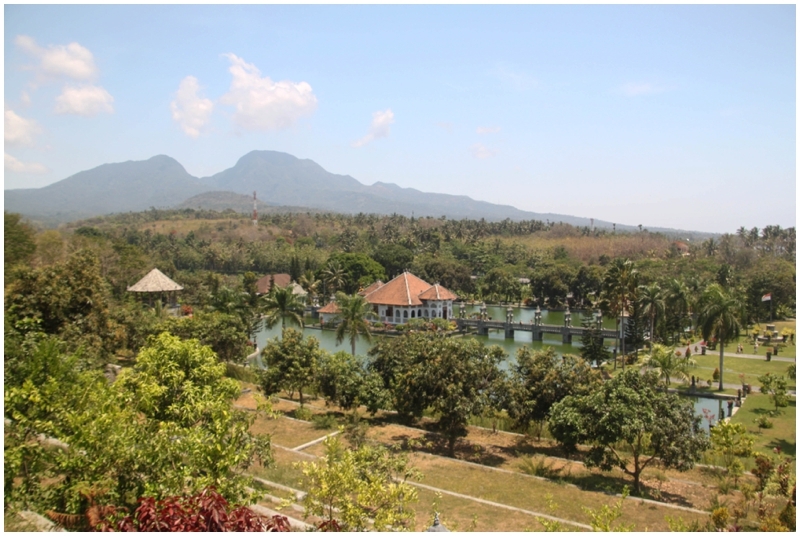 There is a hotel on site and a restaurant (Tirta Ayu), although we did not eat as we were grabbing lunch after our visit. A neat feature of this place is that people can bring their swimsuits and towel and actually get in certain areas of the water! We didn’t partake, but we saw a number of others in the water and they seemed to be enjoying it on a very hot day. 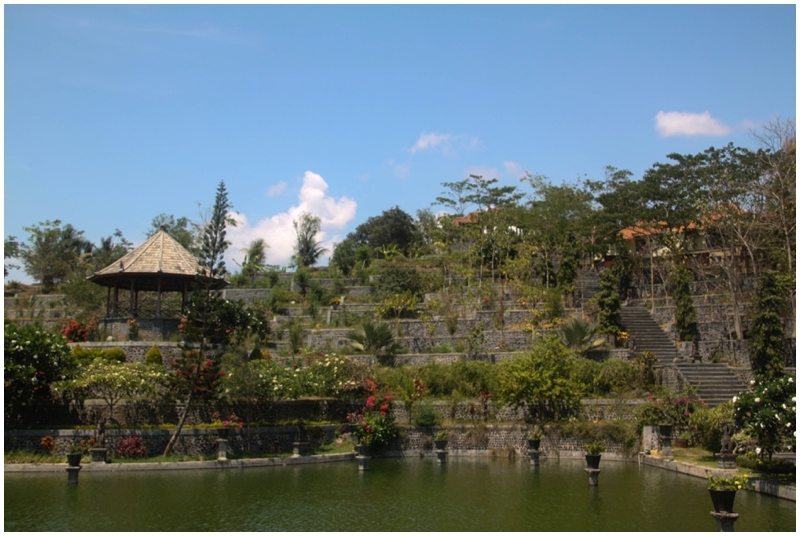 The additional cost to use the pool is minimal, only 10,000 rupiah. Toilets and showers are included. 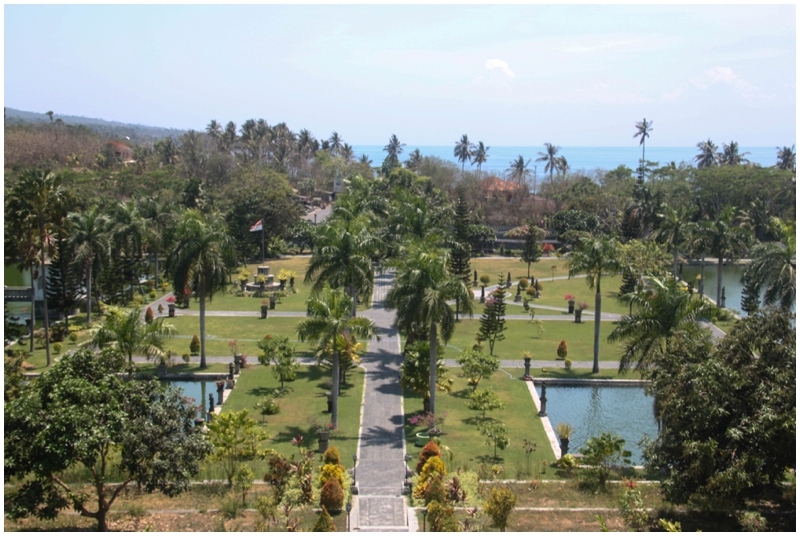 Ujung was built in 1909 by the King of Karangasem. 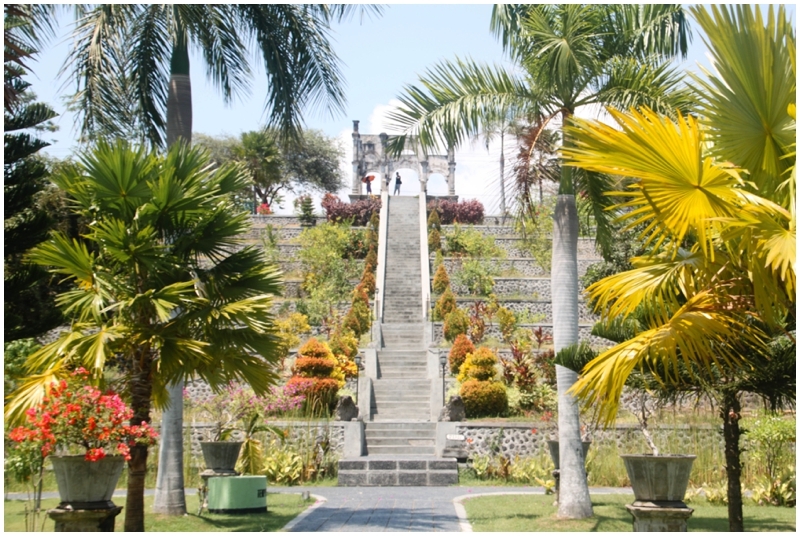 The palace is still privately owned by the Karangasem royal family. 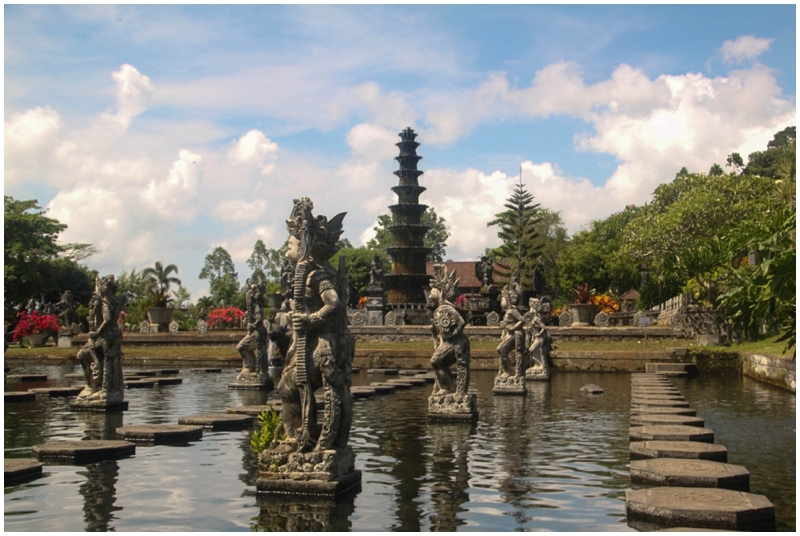 Admission was quite cheap, only 10,000 rupiah per person or $0.82 USD. We loved the layout of this place and it was huge! There are three large pools and a main building sitting in the middle, which is connected by a bridge. When we walked through the building, it was interesting to look at the different pictures and portraits on the walls. The pictures show the King and his family, which included well over twenty children from multiple wives. A different lifestyle, that’s for sure! 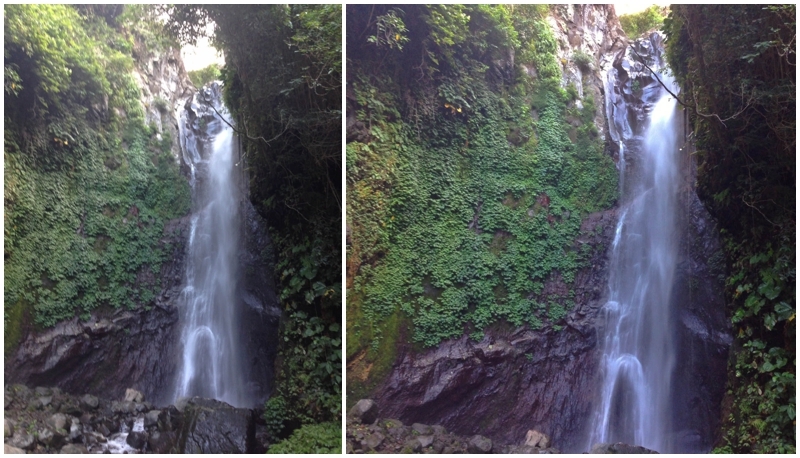 We were lucky to be based in Les for a week, which allowed us to walk to the wonderful Les Waterfall. 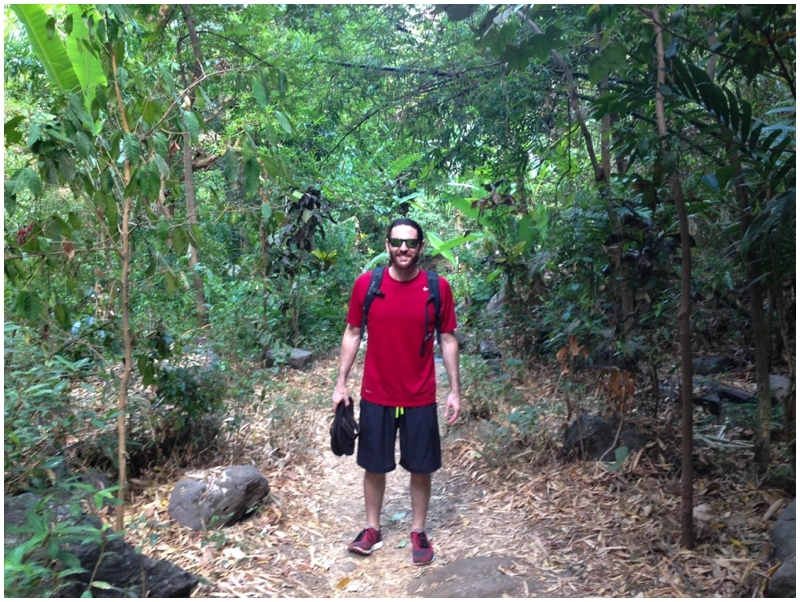 From our place in Les Village, it was a few kilometers into town to reach the falls. We decided to walk and get a little exercise and boy was it hot out! However, the walk was well worth it as we were able to cool off by jumping right into the falls. It was a great experience. 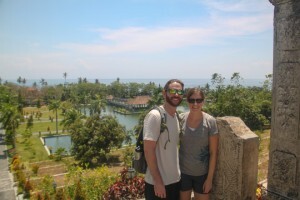 The admission to the falls was 10,000 rupiah per person, which is less than $1 USD. We stayed at the falls for around 45 minutes, relaxed on the rocks and talked with some fellow travelers passing through Les who had heard about the falls. Some locals were actually bathing, as it is a fresh and clean source of water. We only made it to the falls once during our week stay, but we were told we could come back again and wouldn’t have been required to pay another entry fee. Les Waterfall – A little grainy as we only had an iPhone with us. 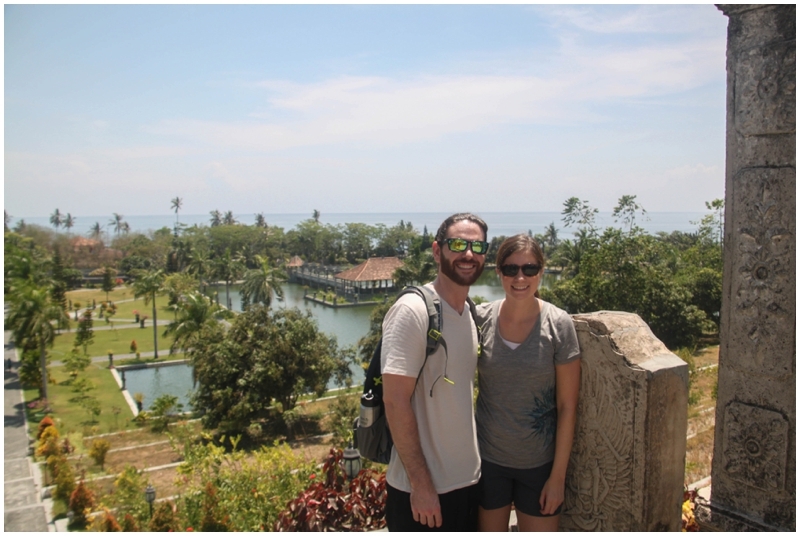 We loved our time in Bali and visiting these places was memorable. 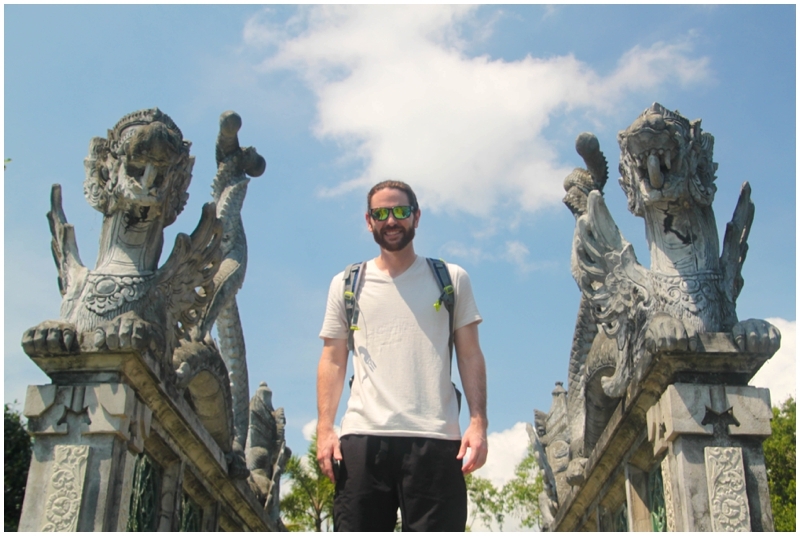 We would recommend them to anyone visiting and willing to make the trip and get away from Ubud or Kuta, which tend to be the main tourist destinations.